Most people really don't know how to set up a bird's play area. We realize that a simple cage isn't enough for intelligent creatures, such as parrots. They need plenty of out-of-cage time to play and exercise. Many of us would rather not have them use our furniture as playgyms -- unless you don't mind beaks "customizing" your furniture to their liking. Some people don't care -- but if you do, a playground will provide a fun playground for your bird and will take his or her focus away from your furniture. The more fun and creative the playground is, the more likely your parrot will want to spend time on it. 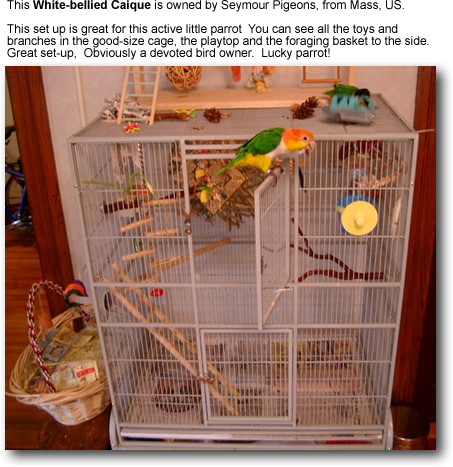 The photos of the playgrounds on this page will help those of us with a lack of "creativity" (including myself) by giving us some ideas as to how to set up our own parrot playgrounds. "Foraging Web Page" -- Great information, tips and photos on how to set up your bird's area to maximize fun and enhanced well-being. Create the most interesting / create bird play area possible. The more fun it is, the less time your parrot is going to spend on your furniture. Natural, non-toxic branches (with leaves would be great). If you are not into building it yourself, buy a really fun playground - with lots of natural branches and toys or toy hooks. Placing two playgrounds together, or the playground next to the cage and adding ladders and ropes to be able to move over to the next area is a fun way to create a play heaven for your pet. Have small bird areas in the spaces that you and your family often hang out in. Birds love your companionship and will seek it. They will follow you around and if they don't have anything to perch on, they will readily accept any of your fine furniture as their personal playground, which you don't want. 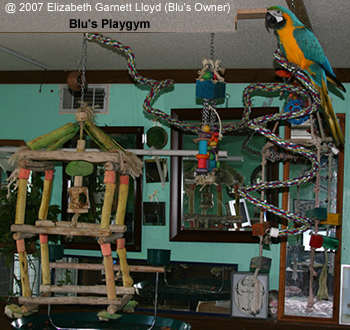 Having playgyms in the different areas will give them a place to go and chew on toys and branches, as they should. This won't mean that they will not try to chew on your furniture; this is where training comes in. A firm "no" and providing them a toy to chew on will teach them what is theirs and what is yours. Use blankets and towels (THICK ones if your pet is a heavy chewer - such as a cockatoo or macaw) and placed them on top of those couches / chairs he likes to sit on. They are easy to wash and you won't worry about your birds ruining your couch. Hide all visible electric cords. Parrots usually like to chew on those, creating fire hazards, in addition to potentially electrocuting themselves!). Attaching the cords higher up behind the appliance or covering the cord with plumbers tubes will prevent that from happening. The plastic tubing is available at Home Depot. Protect your cupboards / high areas with corrugated plastic siding. The kind people often place on the sides and tops of their aviaries or sheds. These panels are available at any Home Depot and are quite inexpensive. By placing them on top of your cabinets, you will protect them from bird droppings and being chewed on. It can easily be cut to size. I let it hang over the sides a few inches prevent the parrot from being able to reach the wood of the cabinetry. If you choose transparent siding, it's hardly visible. Every few months, you simply take the panels outside and hose it down. And voila -- they are clean and ready to be placed on top of your cabinetry / elevated areas. You can enhance your pet's environment further by offering toys in several areas. "Finger toys" are favorites. They are readily available in pet stores; but you can make your own, or use what is readily available in your home (as long as it is safe for birds). Favorites are plastic bottle caps and pen tops. Have toys wherever you hang out - offer them when your pet wants to chew on your clothing or 'body parts" instead. When your pet chews on something inappropriate, a "firm no" in combination with offering an alternative (a "finger toy") usually does the trick. Foraging for food is another effective method to enrich your pet's life. In nature birds keep themselves busy by searching for suitable food items. This keeps them both physically active and mentally stimulated. Bored birds are likely to find their own ways of entertaining themselves, which includes chewing on furniture, which most bird owners would like to discourage. There are many options for introducing healthy foragnig into a bird's life, such as offer almonds and other nuts in the shell to the larger parrots; or hiding food items (seeds, nuts, etc.) in a container filled with shredded paper - so that they have to look and dig for their food. Healthy treats, like grapes, berries, apples, carrots can be offered in foraging cup, cut a piece of (blank) paper over the cup and secure it with a thick elastic band. Here are some more tips for introducing foraging into your flock.